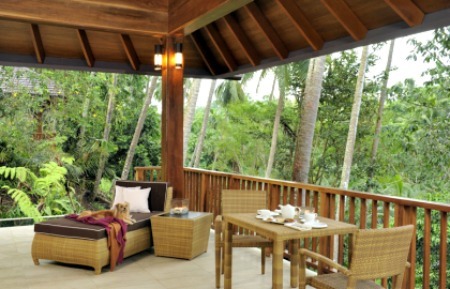 The Farm at San Benito is located in Lipa, Batangas and is one of the quickest escapes from the city. It is also only 15 minutes away from the Mt. Malarayat Country Golf and Country Club. Before it became the multi-awarded resort it is now, The Farm began as a coconut plantation until German Eckart Rempe and his Filipina wife Perla turned it into a holistic healing sanctuary. General Manager Michael Di Lonardo said that The Farm, which was built in the early 2000s, initially had 23 guest rooms which offered the promise of raw food and natural healing therapies. Since then, The Farm has slowly evolved into an 11-hectare land of beautiful gardens with 33 guest rooms and 11 pool villas. It also offers its own products for healing sanctuary treatments, integrated medical services. The Farm’s medical team is well-trained in natural therapies that cleanse the body and boost the immune system, Lonardo said. Meanwhile, integrated medical services available at The Farm include Colon Hydrotherapy (colon cleansing), internal organ compresses, body and foot baths, detox therapies, acupuncture, weight loss programs among other integrated health services. The Farm also offers fitness training, yoga sessions, outdoor exercise activities such as fitness walk, power walk and an Oil of Life tour that allows guests to experience the process from harvesting coconuts to the production of virgin cold-pressed coconut oil. Di Lonardo said that The Farm is most popular among type A businessmen who want to take their mind off the daily grind of work as well as those interested in good health and avoiding sugars, eating healthy foods and avoiding chemical medicines. However, he added that The Farm has accommodation for all types of people. The Farm’s traditional Sulu terraces are a great entry level room for young people, he said. Meanwhile, the Narra pool villas have attracted the attention of the A listers and corporate world who have very limited time to relax and want to make the most of it. A number of celebrities have also been spotted taking a weekend getaway at The Farm, which also happens to be pet-friendly. According to Di Lonardo, the Farm gets a fair mix of both foreign and local guests, especially during the weekends. The middle of the week also has some good specials to take advantage of. Guests should prepare themselves for a vegan diet since its restaurant does not serve any animal products including eggs, milk, cheese, meat and fish, especially those factory grown ones which are full of antibiotics and cause health problems, Di Lonardo said. Regardless of the absence of meat in the menu, The Farm food is guaranteed not just healthy but also flavorful and creative. Cooks use only natural products in the meals they cook, many of which are grown at The Farm. The Farm food is also free from chemicals such as MSG (monosodium glutamate), artificial sweeteners or refined sugar. Among the must-try foods on the menu include Green Juice, a delicious vegetable juice to nourish the cells, Beet Root Ravioli, a great main course stuffed with hand-made nut cheese and the Healthy Halo-Halo, which was featured on Kris TV. According to Di Lonardo, The Farm gets about 5,000 guests each year and has significantly helped boost tourism in Batangas. He said that in the future, he hopes that the resort’s natural healing and good health message would reach as many people as possible. The Department of Tourism (DOT), for its part is still working on efforts to improve health and wellness tourism in the country and position itself as a premier health holiday destination in the near future. Assistant Tourism Secretary Benito Bengzon Jr. earlier said that although the country has potential in the health and wellness sector, it is still in the process of establishing its strongest points.